The Kev started tearing down the closet wall today. Let joy be unconfined! This is one noisy activity, and caused the cats much consternation. 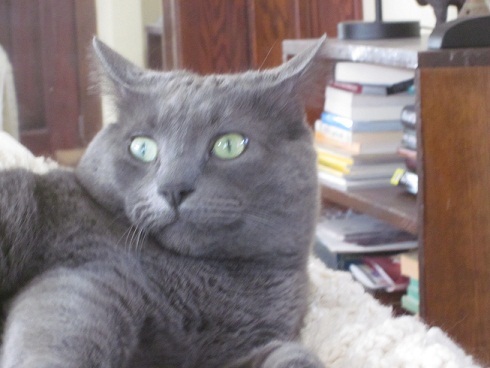 When I was a kid, I had a book featuring drawings of feline expressions, including something called the “look of doubt” involving one cocked ear and a slightly worried look. This cracked Mom and I up big-time. Because it’s funny! 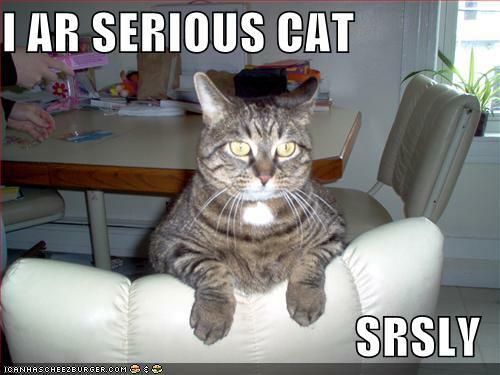 So funny that many of the “serious” LOL cats use this expression. And with the noise from the bedroom, we’ve had quite a few examples here today. 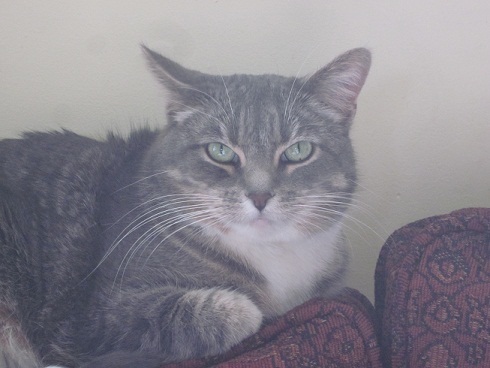 Mayya plays it cool, but her ear gives her away. This is not a load-bearing wall (yay! ), and I wouldn’t recommend cutting into anything you aren’t sure about on that point. We also did not need to contend with wiring or pipes in this area, which is another thing to look out for (before whipping out the sawzall). 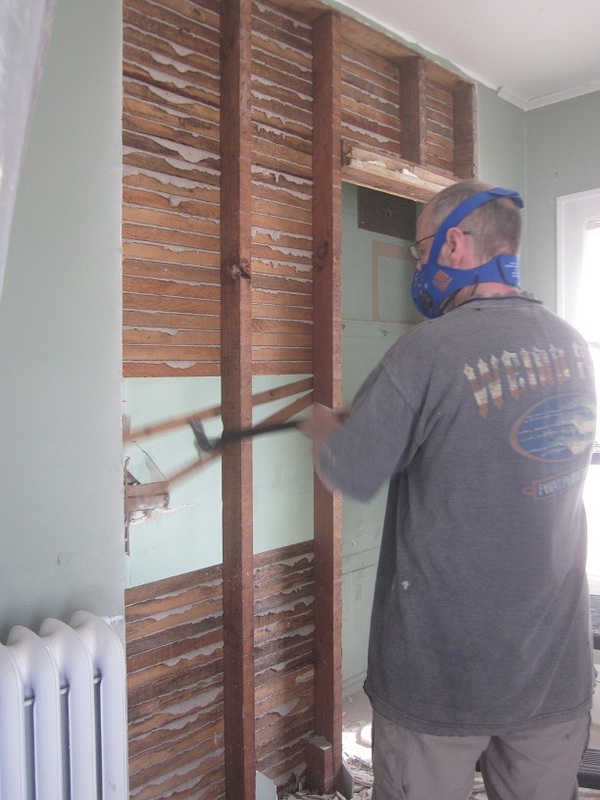 Kev used our reciprocating saw to break out panels of plaster, then the crowbar (as shown above) to take down lath. To get a nice straight line in the plaster by the last stud, he scored the wall with an angle grinder before taking it out. He is currently using what’s left of the sawblades to remove the studs. The stud by the new (still not leaking!) radiator is further right than we expected, but we will still be left with a five-foot closet opening. Bifold doors are sold for the actual size of the opening, so a 60-inch opening calls for two pairs of 30-inch bifold doors. The manufacturers figure in the necessary gaps. There’s a lot of wiggle room in this type of installation — you wouldn’t need to be Houdini to escape from our new closet. With the wall open, it’s easier to show what we’re trying to accomplish. Behold my amazing Paint skills! We generally strive to be sympathetic to the house’s era, but ultimately, the house serves its occupants. While bifold doors aren’t exactly 1922 state-of-the-art, accessing this storage space more easily is going to be very enjoyable. Almost as enjoyable as watching the Kev be all manly wielding implements of destruction. 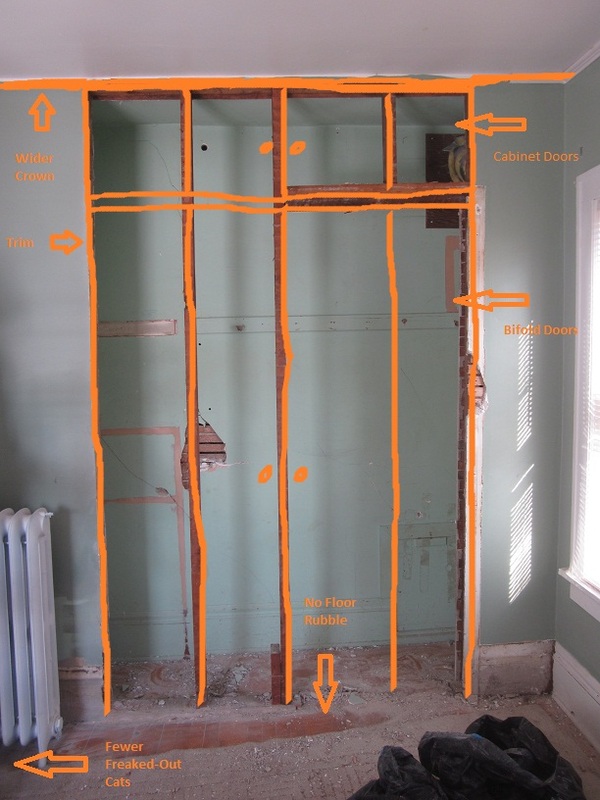 This entry was posted in Construction, Walls & Floors, Windows & Doors. Bookmark the permalink. Opening up you wardrobe makes so much sense! I’m sure it’ll be so much easier to store and access things! Can’t wait to see the result! P.S. Loving your American vs. English post, too!